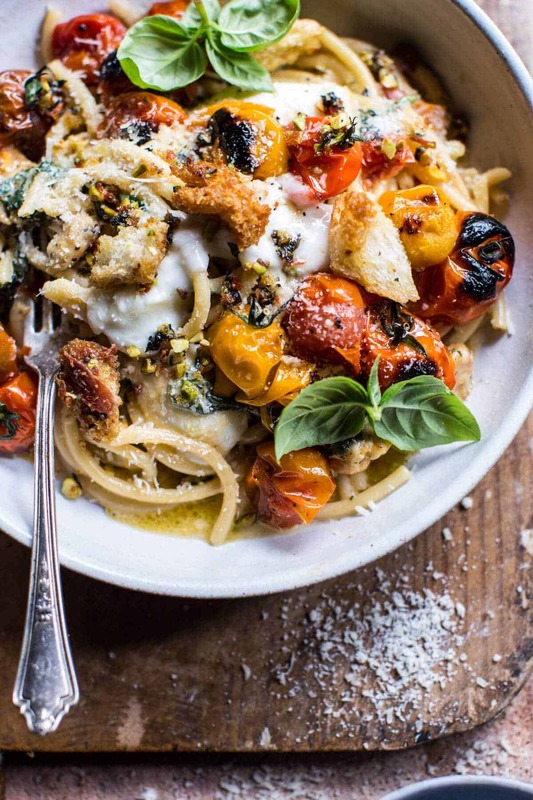 Charred Tomato Basil Chicken Florentine Pasta with Herb Butter Breadcrumbs. Oh um, hey! How about some comfort carbs for your Monday?!? How was everyone’s weekend?!? Hope you guys are enjoying summer as much as I am. I will not lie, the last few weeks have been crazy, but I’m really enjoying these warmer long days… and sad to see summer flying by. Asher was over hanging out all day on Saturday, and man, that girl knows how to talk. We actually talked about our upcoming trip to the Wizarding World of Harry Potter. We finally have the dates set! YESS. I have been pushing this trip off all summer, but we are going to go right before school starts. We are both so excited. We have not booked tickets just yet, but only because we cannot decide on whether we should head to the new Wizarding World in LA or go to the one in Orlando. SOOO, you guys have to help me!! Has anyone ever been to either? Or even better, have you been to both? If so, you have to tell me all the ins and outs because we are 2 way too excited girls, and planning mode has begun! First things, first though, LA or Orlando? I kind of want to say LA just cause my brother is there and we would get to see him as well, but then I know the Orlando Park has a bit more to offer, and well, I do LOVE Florida, and I haven’t been there in far too long. Or well, actually I was there a year ago last Easter, but that’s still way too long! Anyway, what do you think? Let me know!!! Alright now, can we please talk PASTA! Um, OK. I am kind of excited about this tomato basil chicken florentine pasta. It’s my kind of summertime comfort food… and yes, there is cheese!! 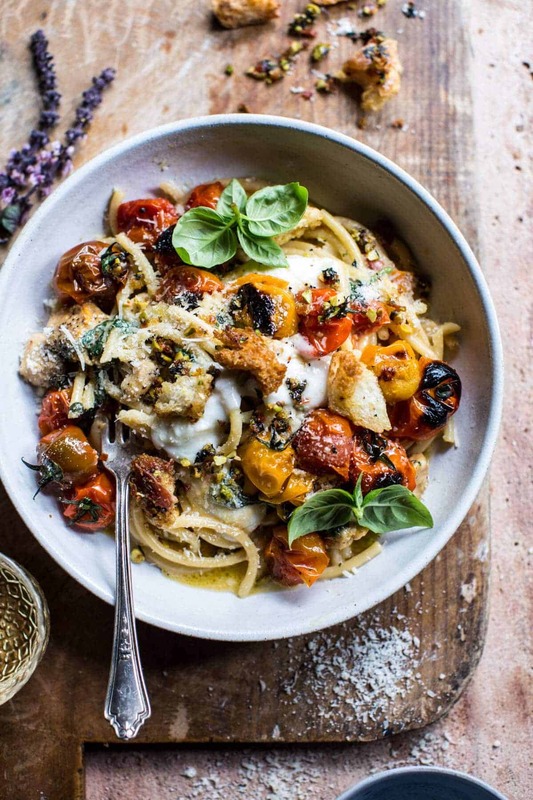 Okok, but while I love all the pasta, the tomatoes, and the basil, what makes this pasta really special are those breadcrumbs!! Oh my gosh…more carbs, and I love it. 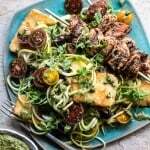 They’re buttery and delicious and full of saltiness, fresh herbs and pistachios. Honestly, put these breadcrumbs on top of any savory food and I will be a very happy girl! You see? Best pasta ever, right? Perfect for a quick and easy Monday night dinner? FOR SURE! Oh, and there is chicken in this dish, but it can easily be omitted to make this a meatless Monday meal, so whatever you prefer!! Just one important thing to note, use really good cherry tomatoes, tons of fresh basil, and don’t skimp on the cheese. I mean, duh. Wait, I also feel like I should mention that this is kind of a great meal to serve to guests as well. I mean, not only is it beautiful, but come on, it’s creamy, delish, and basically a bowl of heaven. Oh, and one of the best ways to impress guests without breaking too much of a sweat. Or well, you might sweat if your kitchen is as hot as mine. The logs that this barn is made with just seem to hold in the heat. Can’t say I hate it though, I’ll take all the warmth I can get while I can get it! 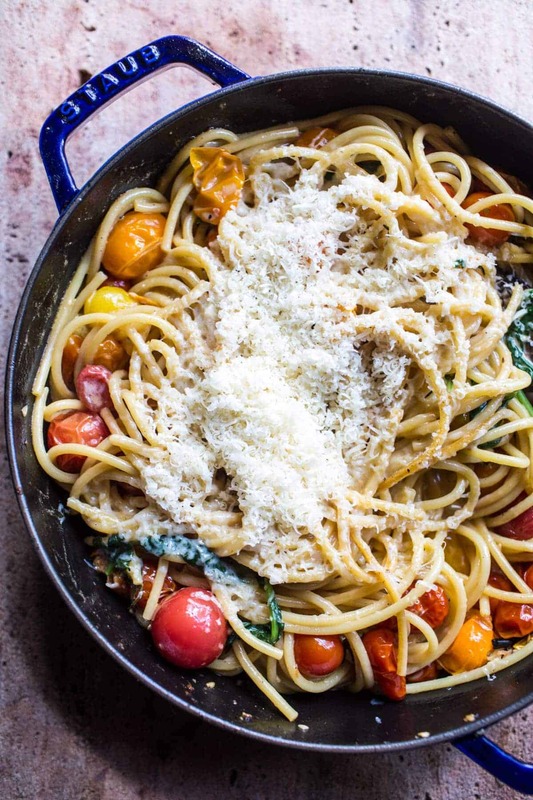 For real though, pasta + cheese + basil + tomatoes + wine + bread crumbs?!?! SO GOOD. 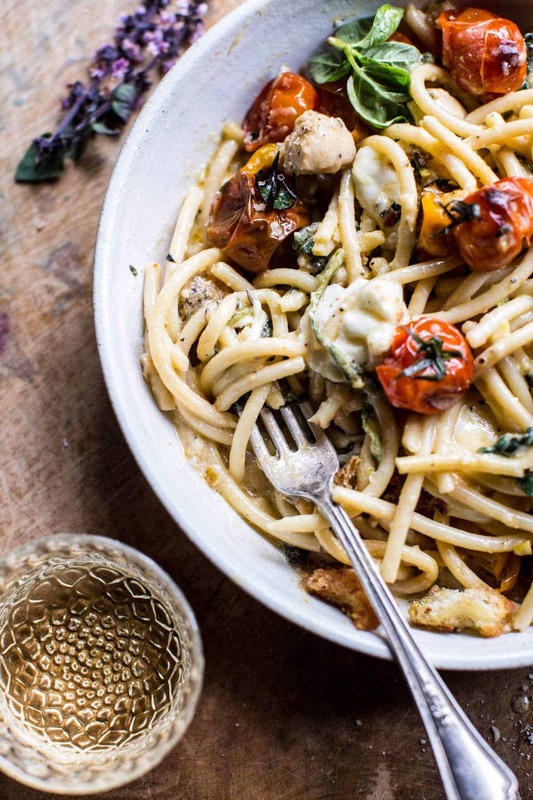 Alight, so pasta tonight to kick off what is sure to be yet another fun-filled, busy summer week! What do you guys have planned?? Bring a large pot of salted water to a boil. Boil the pasta until al dente. Just before draining, remove 1 cup of the pasta cooking water. Drain the pasta. Meanwhile, heat a large skillet over medium high heat. Add 2 tablespoons olive oil and 2 tablespoons butter. Add the chicken and season with salt + pepper. Cook until the chicken is cooked through, about 5-8 minutes. Remove the chicken from the skillet and set aside. To the same skillet, add the remaining olive oil and butter. Add the cherry tomatoes and season with salt and pepper. Cook the tomatoes without stirring for 2 minutes. After 2 minutes toss the tomatoes and cook another minute more or until the tomatoes are blistered. Add 2 cloves garlic and cook another 30 seconds being careful not to burn the garlic. Remove the tomatoes from the skillet to a plate. Set the skillet back over medium heat and add the remaining 2 cloves garlic, cook 30 seconds, then deglaze the pan with wine. Allow the wine to cook until it has reduced by half. Stir in the milk and parmesan, season with salt and pepper. Once the pasta is cooked, added it to the sauce along with the spinach. Cooking until the spinach has wilted, about 3 minutes. Stir back in the chicken and tomatoes. Cook until warmed through, about 3 minutes. If needed, thin the sauce with the reserved pasta cooking water. Remove from the heat and stir in the basil, lemon zest and mozzarella. 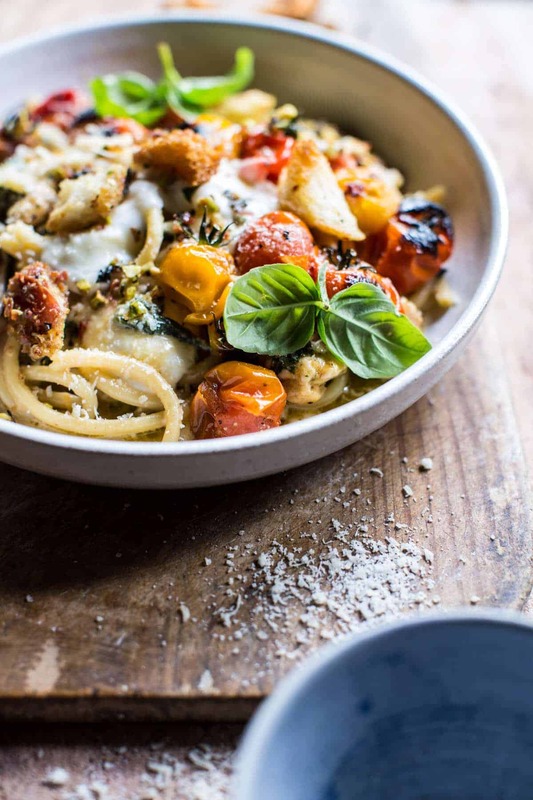 Divide the pasta among bowls or plates and top each plate with bread crumbs, crushed red pepper and fresh basil. EAT! Place the prosciutto slices on the baking sheet. Bake for 8-10 minutes or until crisp. Remove and allow to cool. Once cool, finely chop the prosciutto. To the baking sheet, add the bread, butter and pistachios, tossing well to evenly coat. Place back in the oven and toast the mixture for about 5 minutes or until the bread crumbs are golden. If the bread crumbs seem as though they need more butter, add another 2 tablespoons. Remove from the oven and stir in the prosciutto crumbs. Season lightly with salt, and stir in the herbs. All I can see in my future is pasta, pasta, pasta. No complaining here! 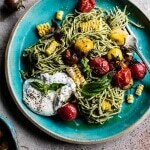 Charred Tomato and Corn Pesto Pasta. 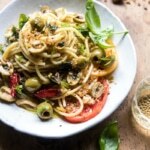 Garden Fresh Herb, Olive, and Parmesan Pasta with Pistachio Breadcrumbs. 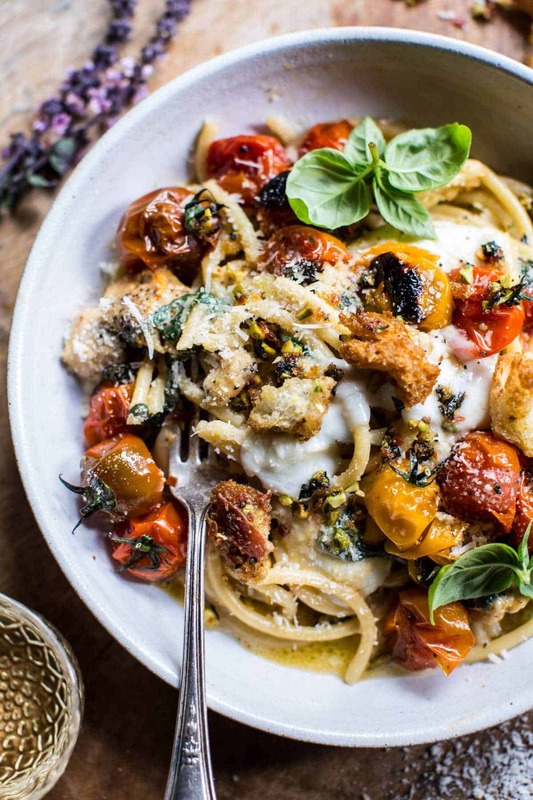 Mediterranean Chicken and Summer Squash Noodles with Fried Halloumi. 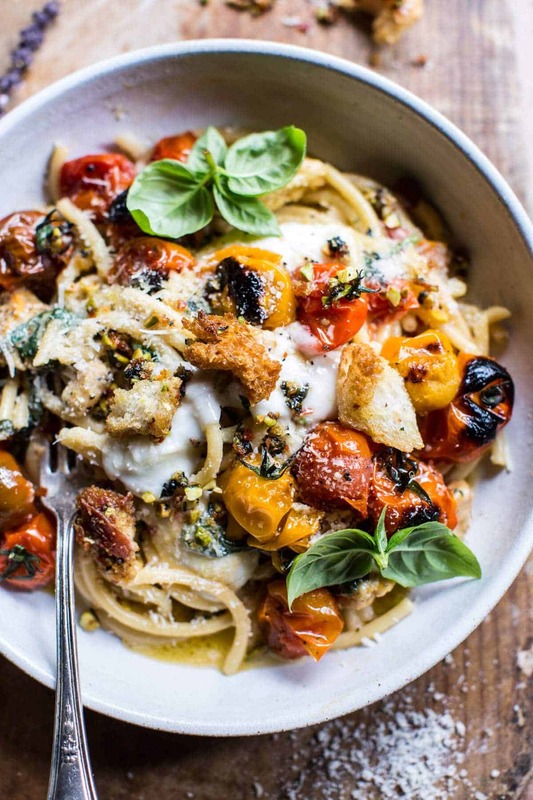 Yes, this dish is absolutely the best kind of summer comfort food Tieghan! I can never get enough tomatoes during the summer. The herb butter breadcrumbs sound delicious too! Enjoy your week! Ah, thank you! I totally agree about the tomatoes! Have a good week too Mary Ann!! Those tomatoes look soooooo delicious!! I’m definitely down with some serious comfort food like this! Oh, and I say Orlando would be awesome, but that’s because I grew up going to WDW so I’m partial to FL and you may have a better time in LA’s weather. You must share some pics when you go!!! I think it’s going to be Orlando! I will totally share photos! This is BEAUTIFUL! My mouth is watering and it’s 7am haha. So perfectly summery ?? I absolutely love that pot you used! the pasta looks beautiful in it!!! AH!! Thank you!! I love it as well!! 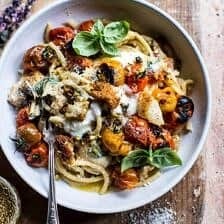 Do you think this would work well with spiralized zucchini noodles instead of pasta? Not that I don’t love a good carb loaded Monday!! Hey Tamara, yes I think this will be great with zucchini noodles. Just be sure to serve it right away because the zucchini noodles will draw a lot of water. I would add them when I say to add the cooked pasta and then just warm them through so the zucchini gets a little cooked and is warm then serve right away. Let me know if you’ve any questions hope you love this, thanks!! i vote for la! that park isn’t as big, but the weather is so much nicer and there is so much more to explore outside of the park (la food > orlando food, pretty beaches, etc). Thats true!! We won’t have too much time for other exploring so i’m leaning towards Orlando, just so we can see it all! But A LA trip is needed as well!! This is certainly my kind of recipe but I’ve been so hot today I’m eating popcorn and yogurt for dinner. Haha!! That actually sounds kinda nice! If you’re mainly going for the park I definitely say Orlando! It’s a bigger park so I think Asher would have more fun exploring. It’s amazing and riding the Hogwarts Express between King’s Crossing and Hogsmeade is one of the best parts! I think so too!! Leaning more towards Orlando!! It all sounds amazing!! This is my kind of comfort food. Looks amazing! I’m obsessed with burst cherry tomatoes lately. Definitely going to try it! I vote LA. I just moved here a month ago and it’s awesome! Ah, same!! They’re delicious! I’m so jealous of your move!! Hope you love it!! Haha! YES!! What A great way to do Mondays!! Thanks Christine!! I’m going to take A look at yours now!! Before I even finished reading this post I just had to chime in about the awesome theme park!!! Orlando for sure!!! You can ride the Hogworts Express between Diagon Alley and Hogsmeade!! what!!! I had dual park tickets which are a must!!! And really you will spend most of your day if not all of one day between Diagon Alley!! Which is to die for!!! And Hogsmeade!!! There is sooo much to see and do there. It’s beyond Tieghan! Also the rest of the park is pretty cool too! I’ve not been to California, and I’m sure it’s awesome…but also in Orlando not too far down the street is a few pretty great water parks. Disneys Blizzard Beach and Typhoon Lagoon, both of which are honestly great! YAY! Thats what i’m thinking! This all sounds amazing!! I’m getting so excited!! Thanks for the insight Cassandra!! ☺️ Thanks so much Laura!! I’m pretty excited for it!! Also to write about it!! Wow! 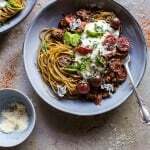 This pasta dish looks gorgeous and I am sure tastes superb too. I haven’t been to both parks yet, but they sure are part of my bucket list. You don’t strike me as a Pothead. Are you? Hey Loi! Thank you so much! I love Harry Potter! Hope you love this dish! 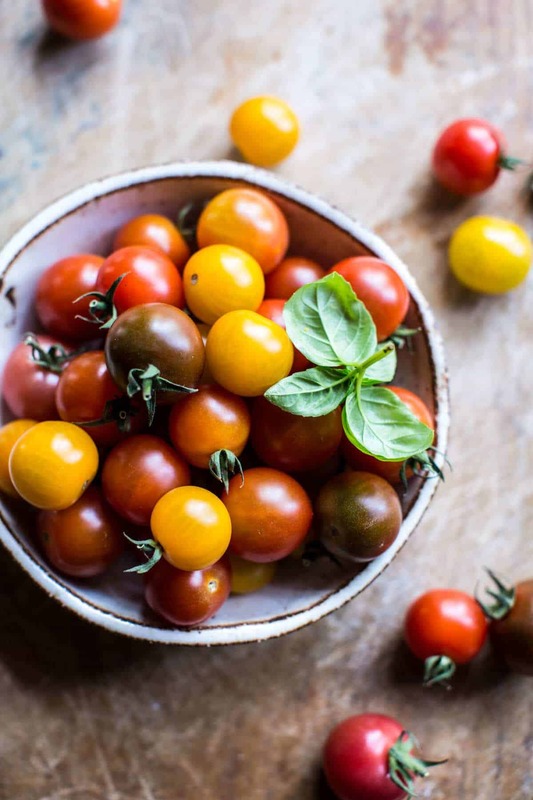 I have a cherry tomato plant that is loaded and I had just told my daughter (who also loves to cook) that I needed to find a blistered tomato recipe. Low and behold Instagram (Food and Wine) soon showed me a picture of your recipe. I cannot wait to try it. Looks so delicious. I made this last night and it was amazing!! !All of the flavors went together in such a wonderfully unexpected way for me. Also, my husband ate most of the croutons before the even made it to the plate 🙂 Thanks for an excellent addition to our dinner rotation! That is so awesome to hear! I am so happy you enjoyed it, thanks Alexandria! Just made this last week! I am in love! It is so good! YAY, so happy you like it Liz! Thanks! I just made this and it was so delicious! I can’t wait to have it again. Question, is the sauce supposed to be thick or get thick? Mine didn’t get that thick. I had to ask just because in the directions it says to add water if it gets too thick. HI Alanna! the sauce is just supposed to coat the pasta, so not watery, but not thick like a paste. If you wanted a little looser sauce than I’d add water, but it sounds like your sauce was perfect! Let me know if you have questions. Thanks! What would I do without your recipes? 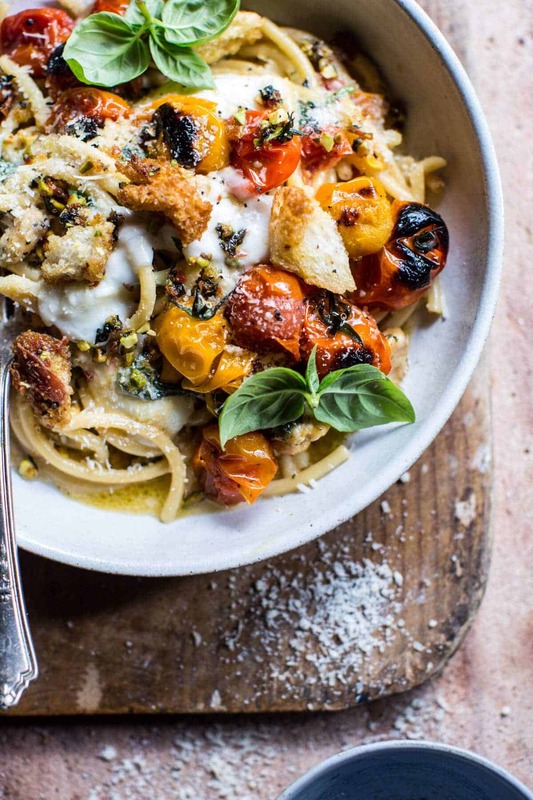 We loved this pasta dish tonight – and the fam gets leftovers for their lunches tomorrow. Awh thanks so much!! So happy you liked it! I’ve encountered an issue with this one – as soon as I add the milk it cuddles to cheese. I tried starting over and warming the milk first but as soon as I add it to the wine it curdled again. I’m at a loss as to how to create the sauce now that the pasta water has gone down the drain. Hey Carrie, It’s so hard to say without knowing how you are making the recipe. What percent fat is your milk? Hope I can I help problem solve for you. Sorry for the trouble!